A warm slightly undercooked skillet cookie topped with a big scoop of vanilla ice cream with a drizzle of caramel and chocolate sauce. These pizookies are the best! One of my most favorite desserts is a Pizookie. 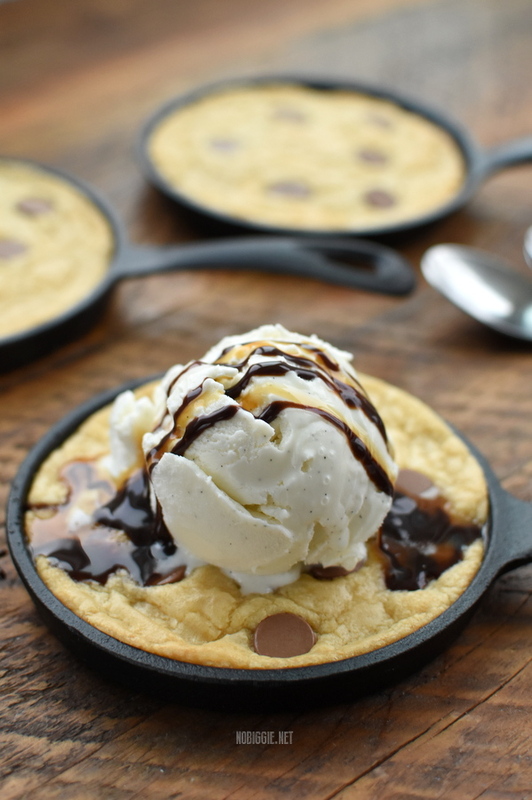 If you are not familiar with the word pizookie…or pazookie, it’s a warm, slightly undercooked chocolate chip cookie baked in a cast iron skillet served with a big scoop of vanilla ice cream. 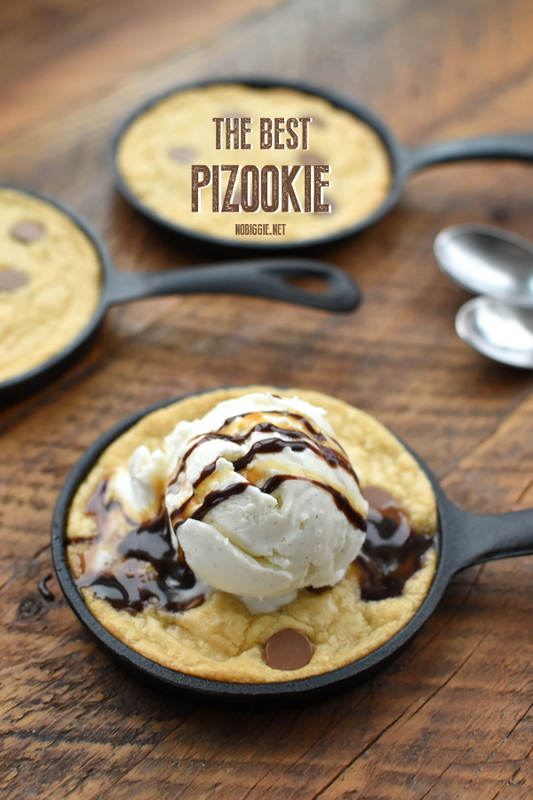 The name is like a small pizza sized cookie: pizza + cookie = pizookie. It’s the ultimate chocolate chip cookie. One of my favorite places to order a pizookie when eating out, is at the Pizza Factory restaurants here in Utah. They call their pizookie a ‘Never on Sundae’, and it’s so good. There is something about their cookie dough recipe, that makes it so good, and this is the best copy cat recipe! 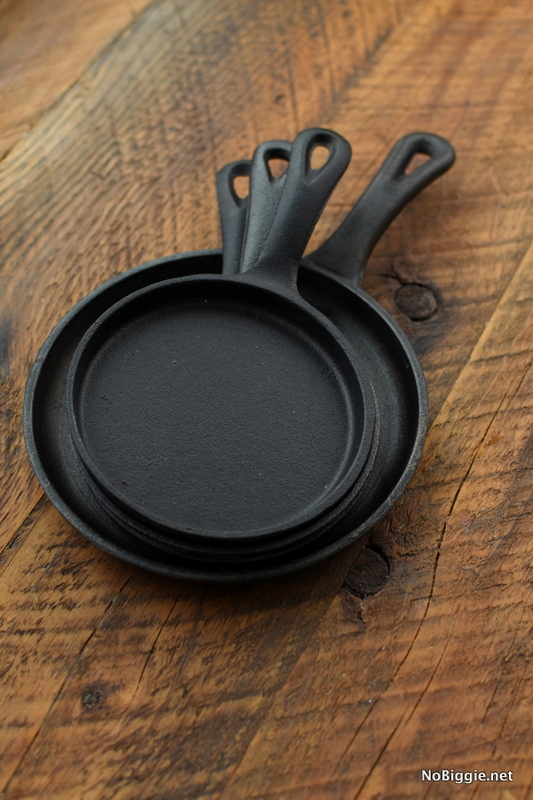 We use these small to mini cast iron skillets. There are two sizes of these smaller skillets. We have found that the small one is great for feeding one, while the larger size is good for feeding two people. You can find these types of skillets here. We have also seen them at the thrift store. 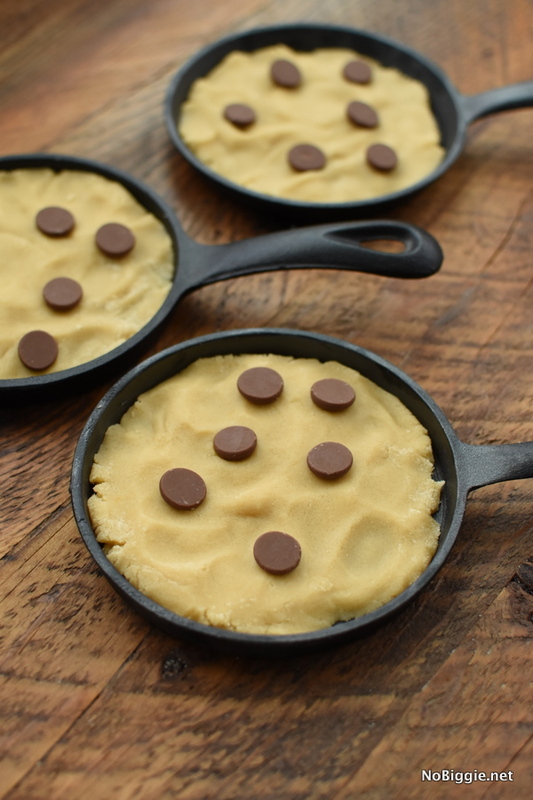 We have a few of these mini cast iron skillets specifically made for skillet cookies: pizookies, and on our first time baking in them, we filled the little skillets a little too full. We later learned that one mini skillet doesn’t need that much cookie dough in it before baking. We also like to serve pizookies in metal tins. They work great for feeding a crowd with no clean up afterward. The smaller ones are great for single servings and the larger size can easily feed two. 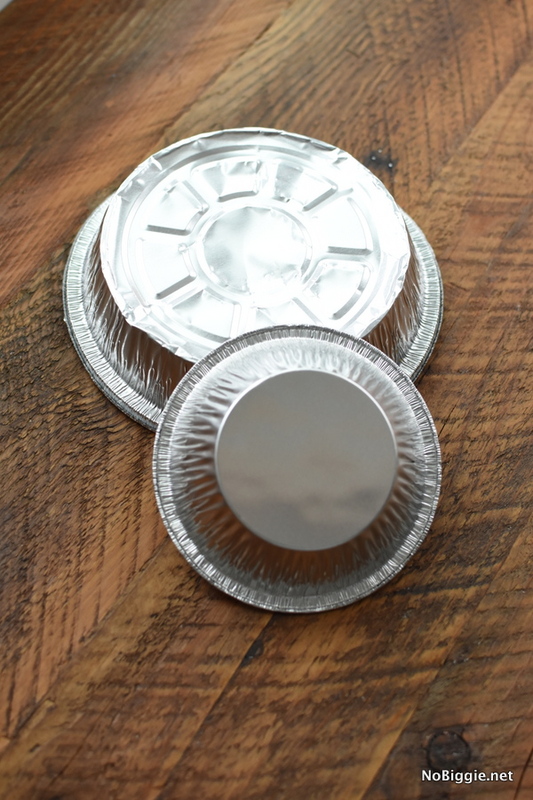 We hosted some of our daughter’s friends over, and we used the small tins. I picked them up at Cafe Rio for 11 cents each. The larger size I found at the Restaurant Supply Store for 0.24 cents each. Each girl got to add in her own chocolate chips…it was pretty funny to see how many chocolate chips they each added. Some of those girls REALLY like chocolate! Ha! Everyone has their favorite chocolate chip cookie recipe, but this recipe is a little different from our go-to, this recipe has two surprise ingredients: instant french vanilla pudding and almond extract. We think the flavor is pretty close to the chocolate chip cookie -pizookie at the Pizza Factory. This recipe makes a double batch. If you are going to make a big mess in the kitchen making cookies, you might as well make a double batch and freeze some for later. Cookie dough in the freezer is always a good thing. My grandma would be proud to know I have cookies or cookie dough in the freezer. 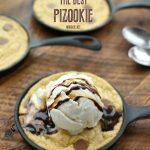 How do you make a homemade Pizookie in a Skillet? 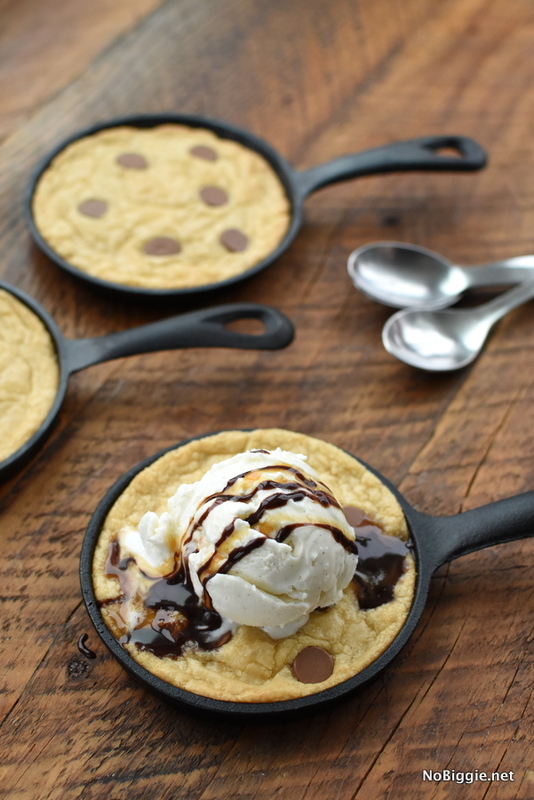 It’s so easy to make a skillet cookie. Just mix up a big batch of THIS cookie dough. 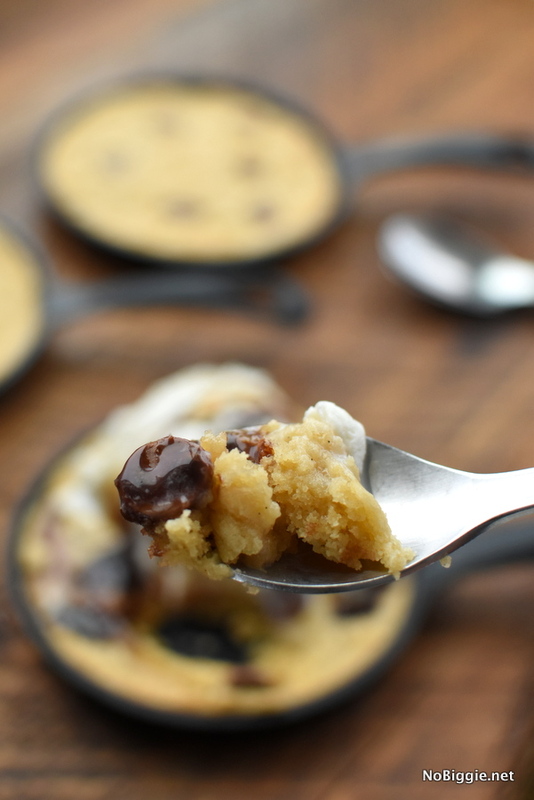 Add a few chocolate chips into each skillet with cookie dough right before baking. The key is to under bake these. The top outer crust is baked while the inside is like warm cookie dough. With the vanilla ice cream it is the ultimate dessert. 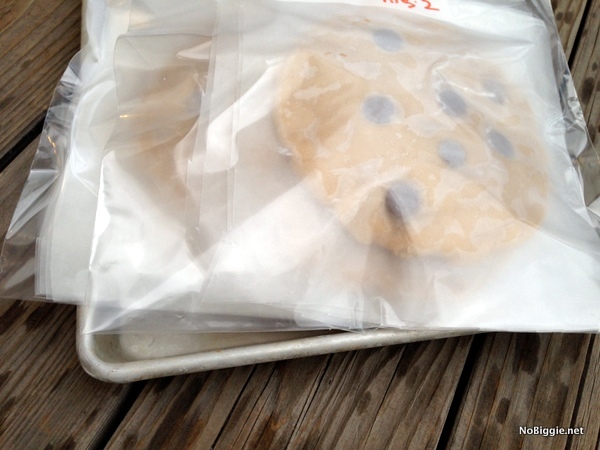 After we baked a few, we pre-measured the cookie dough future pizookies, wrapped them up in wax paper to freeze and save for later. This is a great make ahead dessert! Adjust your oven time for baking frozen cookie dough. A warm, slightly undercooked chocolate chip cookie served with a big scoop of vanilla ice cream on top. This chocolate chip cookie dough is the BEST! 1 bag Guittard milk chocolate chips they're the best! 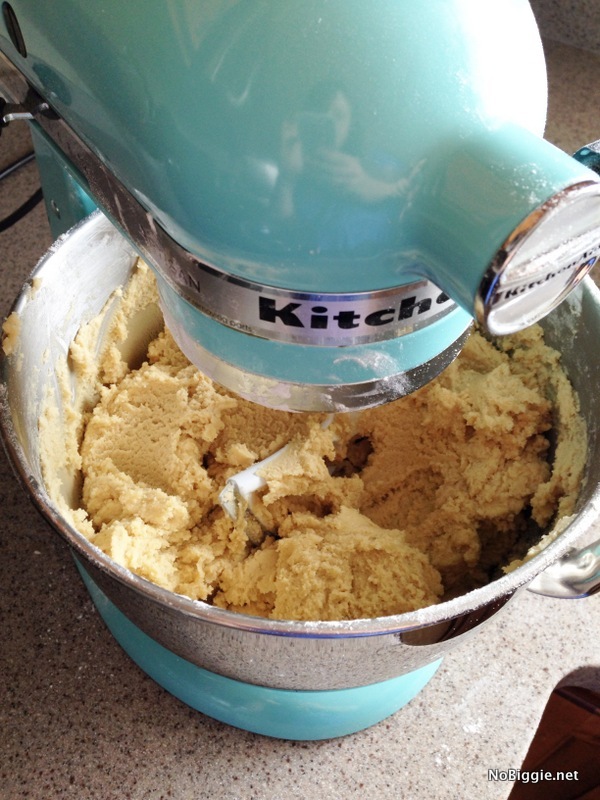 In a stand mixer (or with a hand mixer), cream together the butter with the white and brown sugar. Slowly add one egg at a time to this mixture, followed by the vanilla extract and the almond extract. In a large separate bowl, whisk together all the dry ingredients: the flour, vanilla pudding, baking soda, and salt. Slowly add the dry ingredients to the wet ingredients, until mixed well together. As you make each pizookie and press a thin layer of cookie dough into each baking dish, add the chocolate chips at this time. Space the chocolate chips apart, using as many chocolate chips as you'd like, we think less is more with this amazing recipe. Place as many skillets onto a sheet pan that you can fit. Bake between 10 - 15 minutes depending on how under cooked you prefer your cookie. Take them out of the oven right when they start to brown. Serve warm with a big scoop of vanilla ice cream, caramel and chocolate sauce on top. This recipe is doubled. You can easily cut it in half to make a regular batch. Mmm…it’s so good. I hope you love it! *A big thank you to my friend Mindi and her sister Megan who shared this recipe with me years ago. It’s the best! Just curious – what does Pizza Factory call their cookie pizza? I think BJ’s Brewery copyrighted the name “Pizookie” when they created it in the late 70’s. Whatever they call it, thank you for the recipe. I have one of the pans and was really trying to find how to make a single serving *but* the idea of making a few to keep in the freezer until ready to bake/eat is a great idea. Thank you. Where did you get those cute little mits for the handle and bottom of the pan? Just what I’m looking for! Hi Ellen! I actually found them all at the thrift store. You can find them on Amazon too. Can you just use a regular pan with this recipe ? Sure! A pie tin would be fine!